The final XC race of the season is this Saturday November 4 in Bowring Park. 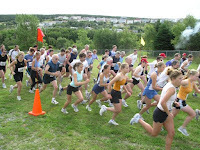 If you have not run cross country before, the NLAA Provincial Cross Country Championships is a great place to start! Distances are 3000m Midget, 4500m Youth, 5000m Junior, and 7500m Senior and Masters. ONLINE REGISTRATION is open until 1:59pm Friday. Volunteers are needed for this event so if you are able to help out please contact Nikita at the NLAA office nlaaoffice@gmail.com or 709-576-1303. Set-up starts 8:30am, marshalling duties start 10:30am, and the event wraps up around noon.